MONTERREY, Mexico – Two police officers were arrested Wednesday in the killing of the top intelligence officer in Mexico's northern Nuevo Leon state, including one who acted as his bodyguard. Nuevo Leon Attorney General Adrian De La Garza said the two state officers are suspected in the kidnap and killing of Homero Salcido Trevino, director of the state's intelligence and security center. De La Garza said one of the officers worked as Salcido's bodyguard, but he gave no details at a news conference Wednesday on what led to the arrests, or a motive. Salcido's body was found Monday in a smoldering car in Monterrey, Mexico's third-largest city. Corrupt bodyguards and police have been arrested several times in the killing of security officials and mayors trying to restore order to Nuevo Leon, a state torn by a turf war between the Gulf and Zetas drug gangs. Meanwhile, a battle between gang members and soldiers left two gunmen dead and paralyzed the western town Zitacuaro, known for its Monarch butterfly reserve. Soldiers chased down some of the gunmen through the streets. While they fled, other gunmen torched a gasoline station and forced motorists from their vehicles to use the cars as roadblocks. 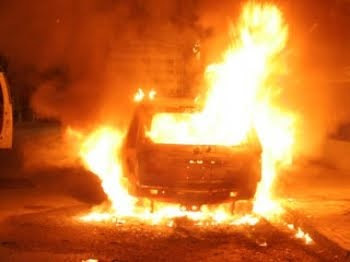 They set one truck on fire and riddled another with bullets, although there were no reports of civilian injuries. Two gunmen were killed, said state attorney general Jesus Montejano. An army officer, who spoke on condition of anonymity because he was not authorized to speak publicly about the shootings, said the battle broke out as soldiers were hunting La Familia cartel's chief operator in Zitacuaro. The suspect was not captured. Michoacan is the cradle of La Familia, a gang known for beheadings and brash attacks on security forces. Several top La Familia leaders have been brought down in recent months, including its leader Nazario Moreno, who was killed in a December gunbattle with police.